MIAMI – Seraphic Fire, Florida’s GRAMMY® nominated vocal ensemble, and the Herb Alpert School of Music at University of California, Los Angeles (UCLA) announce today their partnership to launch Seraphic Fire’s Ensemble Artist Program. 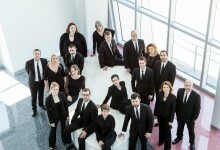 National leaders in choral education, Quigley and Bass’s leadership of the two-week Professional Choral Institute at University of South Florida received critical acclaim that resulted in a Grammy-nominated recording of Brahms’ “Ein deutsches Requiem.” Previously, a recording partnership with Western Michigan University led to the ensemble’s Monteverdi Vespers recording that rose to No. 1 on the iTunes Classical chart.